week two has come and gone and we have learned soooo much about our little baby girl. She is amazing! We are still not on a great sleep schedule yet BUT it is getting better. It is so hard to put her down I feel like I will miss out on a smile or a special face that she does sooo many of. We have visitors during the day (which we love so don't worry if you were one of them. I wil say no if we are not up to it!) so she usually sleeps through those visits and then wakes up right when they leave. IMAGINE THAT! Her time to really sleep seems to be from 12 to 4 or 5 this will come in handy when Edwin goes back to work so I can rest and clean and cook dinner. We are able to set her down now when she sleeps as long as she is in a dead sleep when we set her down. If she is not then she stirs and wakes herself up. She has gained up to 8lbs 3oz and the doctor said everything is going great. Our next appt will be in 2 months (Jan 8th which is also edwins birthday) so it will be interesting to see how much she grows in that time. * She lifts up her head and looks around. we tried to do some tummy time to see what she would do and she lifted up her head and looked from side to side. sooo CUTE! *she holds her bottle (this cracks me upI posted a picture above) We were feeding her one night and I had to grab a blanket so I let go of the bottle for a second and there she was holding on to it and keeping it high enough for the milk to stay at the top. It was so cute! No mom we don't leave her alone like that it is just cute to watch. 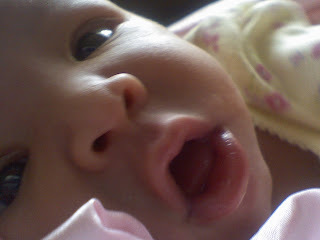 *She is smiling at us when we make funny faces or when we give her kisses. It used to be that she only smiled when she was sleeping (she still does this) now she smiles with her eyes wide open! I think that is about it I am amazed by how beautiful she is and how much she changes daily. I hope that edwin and I can be the best parents for her and teach her so many things. We love her sooo much! Week one went by so fast I didn't even know what day it was half of the time. We really enjoyed the time though. I just kept looking at her and could not believe that we had created this little angel. She is soooo beautiful! When she sleeps she smiles and I can see her dimples it is so cute! Edwin and I are trying to get on a sleep schedule but I don't think it is working very well. She doesn't like to be set down in her cradle or the co-sleeper hat we bought. She will wake up immediately and start crying. We tried to let her stay for a little bit to see if she would fall back to sleep and no such luck. The boppy seems to be my only rescue I can set her down when she is in a deep sleep and then get up and go to thebathroom or do the dishes. My mom has been a huge help! She babysat for us one night so edwin and I could sleep at the same time for a few hours. I never realized how precious sleep was until I am only getting like 2 to 4 hours in a day. When she was three days old we needed some stuff from target and edwin thought it would be a good idea to get out of the house. Sooo my mom said she would watch her so we could go there and get back quick. When we got to target and started walking around I got so depressed. I just wanted to be with her! I started crying..LOL Edwin was like OH GEEZ! I think I cry more now then I did when I was pregnant. When we got home all I could do was hold her and squeeze her and give her lots of kisses. She had her first doctors appointment on Monday 12th the doctor weighed her and she was 7lbs 9 oz so she hadn't lost to much weight. They went over breast feeding with me. I was having such a hard time because I had her latched on wrong in the beginng. I was cracked and bleeding and I dreaded every feeding. So they gave me a sheild and she seems to be doing good with that. Breastfeeding is one of the hardest things I have ever done though I can see why it is hard to keep going. We are chugging along though I am supplementing with Formula and trying to pump as much as possible but I am only getting 1 to 2 oz every time I pump. I hope the milk supply will increase soon. Well that is all for now for week one... It is almost the end of week two and I can't believe how much she has changed!!! I love her sooo much more everyday and I can't believe how blessed we are to have her in our lives. WOW... time is flying by and I decided I needed to take the time and write about the delivery before I forgot everything. I know... I know I should be sleeping... YEAH RIGHT! LOL I will probably have a lot of information and maybe some details you don't want to hear soooo.... I guess if you want to read on you can! With all of the family stress going on my doctor and I decided that we could go ahead and induce me a little early so that my family would all be here for the birth. She scheduled me to be induced Tuesday November 7th at midnight. When I met with my doctor she had given me three options of drugs to get induced with. The first one is pitoson which is the one we knew the most about and the other two were tablets (one was called cytotec and I don't remember the other name). These tablets are inserted vaginally and placed next to the cervix to help ripen it to speed up delivery. The doctor recommended that we try Cytotec so I signed the paper work to use what she thought was best. When edwin got home we did some research on the drug and started to get nervous. The drug is used mainly for ulcers and for abortions. There was not a lot of information on its use in induction. So we decided we would go with Pitoson because it is what we had heard the most about. Edwin decided to go ahead and start his leave on Tuesday so that we could clean up the house and make sure we had everything packed. With everything that was going on I was pretty much a stress ball (and I was pretty cranky... poor Edwin) We were advised to contact the birthing center at 11:00 pm to make sure they were ready for me. So around 8 I went upstairs and took a long shower and made sure to straighten my hair (picture perfect... hehe wish it would have stayed that way!) at 11 we called the hospital and my stomach was in knots. The nurse advised me that they actually had no room for me that night and I would need to call in around 7:30 to see if there was more room. With all the stress and getting myself mentally prepared to actually go in and get induced I was soooo upset they told me they didn't have room. Of course I cried hen we decided we better get some rest. (worst night of sleep, or so I thought) At 7:30 I woke up and and called and the nurse advised once again that they still did not have room. So Edwin decided he would head into work so that he didn't waste his leave on days when the baby wasn't here. I was soooo upset. I understand that they do not know when their "busy" times will be but it is so stressful to plan on going in and then get told twice that they have no room! Sheesh! Edwin got to work around 9:00 and at 9:30 the hospital called me and said that if I got there within ten minutes they would have a room for me. PHEW! So I called Edwin (poor guy) and my mom and I headed out to the hospital. My mom and I got to the hospital and were admitted and in the room by 10:00. The nurse came in and hooked me up to the monitors and the baby’s heartbeat was loud and strong. She also said I was having contractions about five minutes apart. I thought that was funny because I was not feeling anything. I kept telling my mom that I wish I knew what they felt like. The nurse checked me and I was dilated 1 CM and 50% effaced, no changes from my previous doctor appointments. I told the nurse that my husband and I had changed our mind on the Cytotec and we wanted to use Pitoson. She was hesitant and said we would need to talk with the doctor before we made the decision. Edwin got there around 10:45 and at that time we were told the doctor would be over in a few hours so I would need to rest and kill some time. The Doctor (not my regular doctor) came in around 11:45 and explained the drug options to us. She said that she preferred to use the cytotec before pitoson because my cervix was not ripe enough. If they put me on Pitoson right away it could make my contractions to strong to fast. Soooo after all that waiting we ended up going with Cytotec. At 12:00 they inserted the tablet, I hen had to lay flat on the bed (my head could not even be propped up) for 3 hours, after three hours I had to get up and walk for an hour and then they checked me… I was still 1 CM and 50% UGH! So they inserted the tablet again. By this time I was having contractions every 3 min (still not feeling anything) so I was down for another 3 hours and then walked for an hour. My mom and my brother and Edwin were there with me and made fun of me because I was walking in circles in the room. The nurse came in and checked me again and I was only dilated 2-3 CM about 60% effaced. By this time the contractions were pretty strong (according to the monitor I still could not feel them) so they were now ready for me to start the Pitoson drip. I was thankful to not have to lay flat for another three hours. Around 9:00 I started to have some pain (like heavy menstrual cramps) They picked up and were coming pretty strong and frequent. I started complaining to Edwin and he helped me breath through them. The nurse checked me and I was still at a tight 3… by now I am tired of being there and feeling like this is going to take FOREVER! She asked me if I would like any pain meds and I said that would be nice. She gave me stadol around 10:00 and let me say that drug is AMAZING! I felt like a warm blanket was placed over me and while I could still feel the contractions the pain was very little and I was able to sleep. Unfortunately the drug wore off in an hour that is when the nurse advised me that I could have an epidural if I wanted to. OF COURSE I DO! I am only at a three! The anesthesiologist came in at 11:30 and gave me the epidural. It wasn’t as bad as I thought it was going to be. I was so nervous and I could feel my body shaking like crazy. He was quick and very good. After about fifteen minutes I was feeling no pain! They hooked me up to the blood pressure cuff and it went off every 10 to 15 minutes. I tried to sleep in between that time (which is pretty hard to do) Mom and Tony had gone home and Edwin tried to sleep on the couch they had for him. Around 4 I started to have really bad pain the nurse said it was called the peritoneal region and sometimes the epidural cannot numb that as well. She checked me and I was at a 5-6 and 80% effaced. She said the doctor was there and she would come in around 6 to check me and break my water. The contractions were pretty strong and I was feeling them for sure! Edwin had to help me breath through them and I have to say he is the most AMAZING coach he made sure to stay right there with me. The anesthesiologist came in and turned up the dosage on the epidural and we hoped that would take the pain away. No such luck! Finally the doctor came in and checked me and I was at a 6. She broke my water and said the fluid looked clear and good that was at 6:30. After my water broke I could feel more pressure and I told the nurse that I felt like I needed to push a little. She told me not to just because the baby was not quite ready. Edwin and I continued to breathe through the contractions and we called my mom and told them they should come. At 7:00 the nurse checked me and I was dilated to an 8... ALMOST THERE! The contractions were so strong and painful they tried to up my dosage again and that still didn’t help. I told Edwin I didn’t think I could do this anymore the pain was so strong and my body was shaking really bad. But he helped calm me down. When my mom got there she helped rub my leg and told me to breathe. She was a huge help to because she was able to calm us both down a little bit. She was also there to take lots of pictures (which I will post some of them soon... I need to find the memory card...lol) At 7:45 the nurse came in and said I was ready to go! She had me push through 2 contractions (They were about a minute apart) Pushing was hard because I was soooo tired and my legs were pretty numb from the epidural. Mom had to support one leg and Edwin the other. The nurse went and got the doctor and I did 2 pushes while she was gone. Mom and Edwin said they could see the baby’s hair and it was black! That gave me more incentive to keep going. The doctor came in and got down to business (she had a surgery to do at 8:30) I asked her how long it can take to push and she said for new moms it can take up to 3 hours… Talk about bursting my bubble! She coached me through my pushing and the baby was out by 8:15! Thank you JESUS! It was nice that the epidural had wore off a little because I could feel her head come out and then her shoulders. It was such a relief when her shoulders came out. The pressure and pain was gone and I felt relaxed. The doctor did a couple of stitches (she said I did not tear too much) and she was gone by 8:25... What team work! When Malaika came out they put her up on my chest and I was so amazed to see what Edwin and I had created. She was so beautiful! Edwin cut the cord and I told the nurses I wanted him to be the first to hold her. They took her and cleaned her off and Edwin went over and watched everything while my mom took pictures. Malaika Aiyanna Mwango weighed 7lbs 14 oz and was 21 inches long her head was 14 CM. It was the most amazing experience I have ever been involved with. When we looked at her face we saw little pieces of each of us and we were so blessed to have her in our lives. It is so amazing how much love you can have for someone who just came into this world. I am so excited to be able to be a part of her life and to help her grow up to be a beautiful woman. I just hope this time does not go to fast. That day we were so tired but we wanted to show her off to the family. My Brother was there and he was so good with her. My mom (Grandma!) and then Edwin’s brother and girlfriend came. Around 12 we asked the nurses that they let any visitors know we are trying to rest and they should come back in the evening. My grandparents came and my Aunt hazel later that night. Edwin and I were trying to get the hang of changing her diapers and feeding her towards the evening she started getting a little fussier. The nurse came in and asked if we wanted her to baby-sit so we could get some rest… I was so tired I was so thankful for that! The next morning they came in and checked me and said if I wanted to go home I could. Edwin was more than excited to hear those words! My dad finally got to the hospital to see her before we left it was so cute to see him hold her. He was so scared! Edwin and I packed everything up and headed downstairs to load her in the car. We finally got her adjusted right in the car seat and then headed home with our new FAMILY! I will continue to update about our first week soon. I have been trying to keep up on my homework and sleep before finals week is here. We have had lots of visitors and it has been so fun to show her off to everyone. Thank you all for your prayers and support through all of this. It was a hectic week and Edwin and I feel so blessed that everything went well and we have a happy healthy baby girl! My doctor will not be the one delivering the baby because sh is not on call that night but that doesn't really bother me since I know that they are not going to put me with an unqualified person. So that is our update I don't know how I feel right now.. I am excited but also scared! We are really going to be parents! So keep us in your thoughts and prayers and we will be letting everyone know when she arrives! I did go get a pedicure last night with mom and Edwin (edwin liked it by the way) The lady that worked on me said she had given pedicures to pregnant ladies before and they usually go into labor with in 48 hours. She massages my feet and ankles for a good half hour! It was so nice. then she painted my toes all pretty! I hope her magic works! The baby bag is all packed for the hospital. I have packed a few things for edwin and I but we live so close that we are not going to worry about things we need for the next day. We can always send mom home to get it. The baby room is done and the house is clean, and my midterms are complete... WHERE IS BABY? I will keep you all posted on what I think is going to be a VERY slow week. Soooo this week was supposed to go by quick.. and it is NOT! I have not had any contractions this week yet and really do not feel any different. I guess I have been a little more tired than usual but it is also getting really hard to sleep because I am sooo huge! I have a doctor appointment tomorrow at 10:00 so we will see if I have progressed any further. I have noticed some decrease in her movement which made me a little stressed last night. She usually goes crazy when we first go to bed. It is always fun to watch my stomach move and edwin gets to feel her. Last night she didn't move at all. I woke up in the middle of the night panicked but then she did one little movement and I felt better. But she is definately not wiggling around like she was. If it decreases more today I will call the doctor and see whats up. My mid-terms are going well.. I did my music mid-term on monday and was so upset because it was a timed test (100 questions and we had 90 min) I was freaking out! By the time the clock ran out I had only finished 60 questions. So of course I called Edwin crying my eyes out. He told me to write to my professor and ask to take it again. So I did and she reset the test and also told me I can go over on the time! I was so thankful she understood. I actually think a lot of students were complaining because you can't do a test with that many questions that fast. (that is less than 1 min per question). SOOOO I only have one midterm left in my health class ( my other two classes only have finals) I had a talk ith the baby yesterday and asked her not to come until I finish my health mid-term. So far she is cooperating! Well thats all I have for now, I will let you all know how my doc appointment goes tomorrow. Hopefully I wil be posting some pics of our BABY soon!